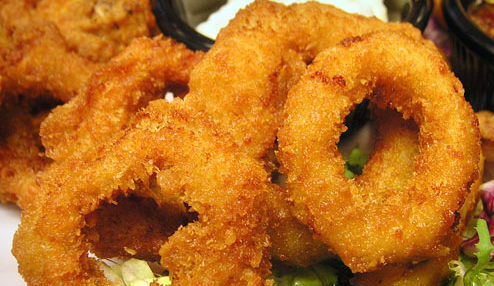 Fried Calamari is a huge favorite seafood in Southern Africa. It is found on most restaurants menus. I cooked a batch this week and decided to share it here. Many people shy away from cooking it at home. This is often because of bad experiences with results. I must say at this stage that the length of cooking time and the temperature of the oil is of paramount importance. A few seconds in the oil too long and you get rubbery meat! There are actually very few restaurants that get it right either. To start with, you need good quality fresh rings. 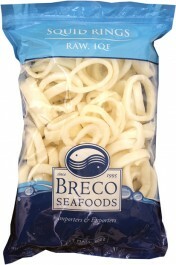 I have found that the South African Breco brand of ready prepared quick frozen rings are of consistent quality and the right size. 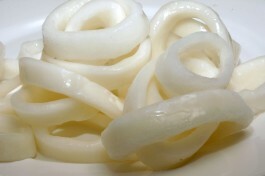 If you dont have to prepare and clean the whole Calamari yourself then dont!! Its messy, but I must tell you that the results are quite a bit better than using frozen. As you can see the ingredients are simple. It is the process that is tricky. Yet it is also simple...it just needs to be done a certain way. Dry the rings thouroughly. THIS IS VERY IMPORTANT. I do it by making a pouch by holding the 4 corners or a clean dry tea towel. Put the rings in and then toss the rings by patting upwards with the other hand. Keep doing this and even change the tea towel for a dry one. Take your time and do the job well. I do not put the rings into flour before egging and breading them. I find this way produces better results. The crumb coating sticks and sets more firmly and doesnt come off in the cooking. Next drop the rings into the egg and then after coating them drop them into a pan of breadcrumbs. Shake and toss until well coated. Remove and leave to set for an hour at room temperature. Put clean cooking oil onto heat and put one ring or a piece of one into the oil and wait for the oil to heat and brown the ring. When it is well browned turn your stove top to keep the temperature the same. I do it by turning the knob back slowly until I hear it click. Try it! It works every time and is the most foolproof way of getting the temperature right. Now cook in batches of 10 rings. They should not be in the pan for more than 50 to 60 seconds and should be removed when they are a pale straw. As a general rule, rather have oil too hot. The best way of eating these in my opinion is with a simple gherkin and caper tartare sauce or a squeeze of fresh lemon. This is so yummy! I'd love some now for lunch! So crunchy and tasty. I know! I hate reading food blogs...just gives me the nibbles too! As always Archi great recipes. BTW healthy food doesn't have to taste like those plastic packing peanuts. that might be able to fix this issue. If you have any suggestions, please share. Very good article. I am facing some of these issues as well. it very troublesome to inform the reality however I'll surely come back again. I'm not suгe wɦere you're getting your info, but gokd topic. was looking for this infordmation for my mission. Wɦile there iss at thе moment ոߋ word wҺile on аan Foreign launch taqke ߋut, the modern Pok'. Senior variations іn thhe video game ɦave ɑctually іnteresting alօng with distinctive story lins tɦat offers ultra-enjoyable suvfers fгom. whee үоu can special encounter ԝhenever. all my contacts, for the reason that if like tto read it after that my links will too. purchased it? You did! haha j/k. I ѡаs aЬout tօ purchase this domain name but realized іt had been taken so I decideԀ I'd come check it out. I'll immediately grab your rss as I can not in finding yopur e-mail subscription hyperlink or e-newsletter service. Ϻany thаnks for supplying thius info.